This was sold to me as an andreanum in a garden center ("vivero") in Guadalajara Mexico in 1972. It was a spindly thing growing in a rusted gallon tin can. I've grown it ever since. I've had it in Mexico, Maine, Massachusetts & New York. Friends have tried it in Florida and California. I've tried bright light, dim light, artificial light, warm weather, constant humidity, occassional drying, frequent watering, presence of bugs, absence of bugs and it's all made no difference. The plant has never flowered. I've shown it to experts who agree that it probably is an andreanum. I'd throw it away except that it was my very first plant. After 25 years, I've grown a bit attached to it. 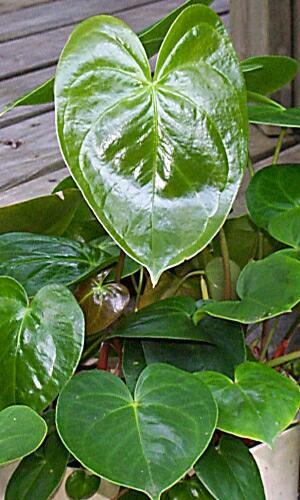 Besides, the foliage is attractive when I actually take care of it. May, 1998 - 4 years ago, I gave an offset to a greenhouse operator in California (if you read this, I'll list your business name if you give me the permission). He assures me that it truly is an andreanum though the flowers are red, small and apparently not show stoppers. Well after 25 years, I'm not going to give up now - this plant shall remain here at least until it blooms.